The spacious apartment of 110 m²/ 357 sqft / 3 rooms sleeps a max. of 6 persons comfortably. It is located on the second floor of a typical turn of the century townhouse and consists of three separately accessible rooms (two bedrooms equipped with king size double beds, one (living room) with a really comfortable convertible sleeping sofa), two bathrooms, each with WC and a completely furnished kitchen (induction cooker, microwave, fridge/freezer, coffee-machine, toaster, dishwasher, steam iron) and as well as a large hall and a stowage room. With the recent renovation of the apartment, explicit attention was paid to maintaining the classy character of the flat (wooden flooring, stucco,primed walls). The apartment is furnished in a sophisticated blend of classical furniture and up-to-date technical equipment, creating a stylish atmosphere. This is a spacious and very well equipped apartment near to the centre of Wroclaw. It is in an old apartment so the entrance is pretty awful but once in the apartment everything is good. We walked to the city centre, the botanic gardens, the cathedral and to the market. It is easy walking through parks by the river and waterways. Nils was a very helpful and attentive host. We really enjoyed Wroclaw as it is so interesting and it is a beautiful city. We found excellent coffee around the corner at Folgujemy, ul. Kniaziewicza 16. Spacious, clean, elegant apartment. Great for a family. The other reviews of this apartment are very accurate. We are a family of eight and we stayed here for three months, so we got to know it and the surrounding area very well. This is a great opportunity to stay in a pre-communist Wroclaw building. There are not many in the city but this is one of them. The ceilings are high, the windows large, and there are ornate old textures everywhere that indicate that it must have once been a grand building. Unfortunately the courtyard has fallen into disrepair, even though we still found it charming. Don't be put off when you first enter the courtyard (there's graffiti and the stairs are very worn and old). The apartment itself could not be more different than the outside of the building. Nils has tastefully restored this apartment with many tasteful modern touches. The bedrooms are all large and we fit very comfortably. The internet is blazing fast and very reliable. There's a large TV + BluRay/XBox for entertainment. The kitchen is small but it had everything we needed to cook meals. The beds are simple but comfortable and the bathrooms are large and clean. My favorite part about this apartment is how it feels so classic but has been restored so well. It's about a 15-20 minute walk to the amazing Wroclaw market square. Two large shopping malls with grocery stores are a 10 minute walk away. There are a few tiny convenience stores where you can buy milk, beer, or snacks on the street. If you want to get to a good restaurant, that's about a 10 minute walk. Tram connections are just a few steps outside the doorway. We heard that this neighborhood once had a bad reputation in Wroclaw but we never encountered any sort of situation that made us feel unsafe. We often walked home late at night. The worst thing we encountered was dog poo on the sidewalk. Wroclaw is a very safe city and even late at night, it feels completely safe. The owner, Nils was super helpful, very responsive if any issue came up and always had fun suggestions for us on what to do in Wroclaw. This was a great apartment, one of the nicest I've seen in Wroclaw. Huge thanks to Nils for making our stay in Wroclaw so good. All the other previews reviews are very accurate. Once you get past the rickety, graffity-laden,front door, the scary front hall way with a cordoned-off hole in the floor and the ancient creaky stairs, you'll find that the apartment itself is top-notch, large, clean, modern with all the necessities and amenities for a comfortable extended stay. With three bedrooms and two bathrooms it's ideal for families or a group. One can only image what an elegant old building this once must have been. A grand old building with tall ceilings and large rooms and imposing doors that, alas, has fallen on hard times and been neglected since 1945. Nils, the owner, will greet you and provide you all information regarding the apartment or the town that you may require. There are many interesting history books in both English and German about Breslau in the apartment, as well as maps and guidebooks. 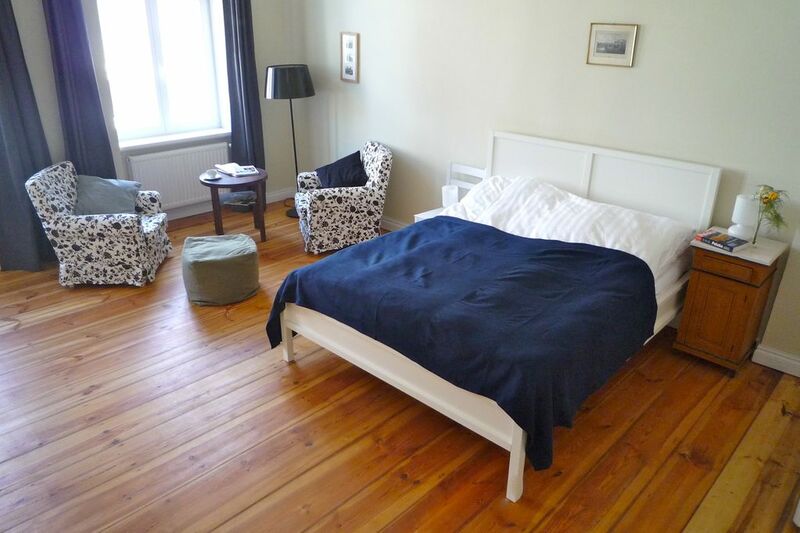 The apartment is only a short 15 - 20 minute walk from the historic old town that has been lovingly restored. I only hopes that the restoration will reach this building some day. There is a large Carrefour supermarket in lower level of the Galeria Dominikanska that's about a 10 minute walk from the apartment on the way to the old town. I would definitely stay here again if I come back to Wroclaw. Nils went above and beyond our expectations of a host. This home was perfect for a family of 6! Nils is a very special host. I can't put into words how wonderful our trip was for our family and my mother. We have Nils to thank for making Worclaw one of our major highlights of our trip to Europe. Our days were filled with activities thanks to Nils who wrote out various suggestions for all ages ranging from a kid friendly zoo day, to a 77 year old European history major. He has a wide assortment of maps and directions available in the apartment so we were able navigate our way around the city. We highly recommend seeing the city and staying in this apartment! Nils began being helpful months before we arrived, answering questions and sending useful links. We stayed comfortably with grandparents, parents and one adult child in the huge rooms. Lots of little extras like laundry soap provided, city maps, Netflix, a huge bookshelf of interesting books and some kitchen staples made it easy to settle in quickly. Nearby bike rental stations, tram stops and bus stops and being within walking distance of the City Center made getting around Wroclaw quick and easy. Nils continued to be responsive to our many questions....where to find services we needed and ordering us an airport taxi for our 4am departure. Do not be put off by the slightly run down exterior of the building; there is a gem waiting inside! Super großzügige Wohnung mit hohen decken und großen Türen. Klasse eingerichtet, auch in der Küche mangelt es an nichts. Lage ist auch super, bis zum Reneyk (Innenstadt) sind es zu Fuß gerade mal gute 10min. Der Vermieter bemüht sich den Aufenthalt durch Insider Tipps möglichst zu verbessern. A 10 to 15 minute walk will take you to the city center, while the apartment itself is located in a quiet area with convenience stores close to it. Otherwise taxis or the tramway are near by. The inner courtyard offers parking spaces. The apartment features satellite TV in English, French, Spanish, German, Polish, blu-ray-home cinema and high-speed wireless internet. The apartment serves as a perfect base to feel at home in Wroclaw !! !